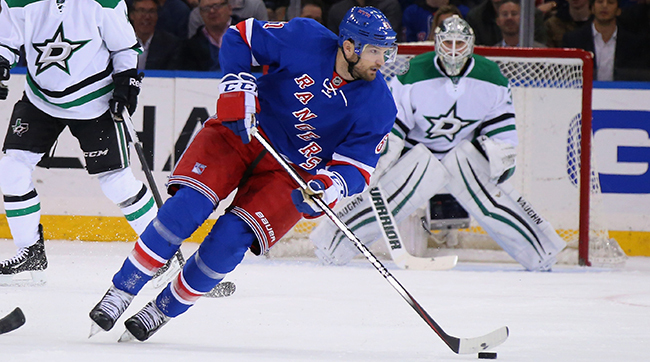 It’s been a rough few weeks for New York Rangers star Rick Nash. After blocking a shot against the Carolina Hurricanes on January 22, Nash has been out of the Rangers lineup with a deep bone bruise. Nash hopes to get back on the ice soon — and so do the Rangers, who are in second place in the Metropolitan Division behind the red-hot Washington Capitals. 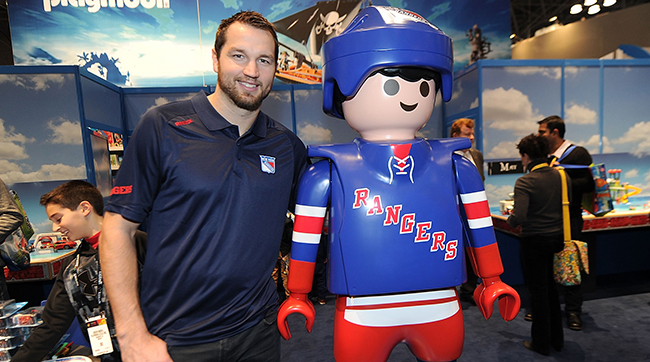 At New York Toy Fair on Monday, Nash’s injury didn’t get in the way of meeting fans, media, and toy industry pros when he helped unveil the second wave of Playmobil’s line of NHL figures. The series debuted in September with the Original Six teams (Bruins, Rangers, Red Wings, Blackhawks, Maple Leafs, and Canadiens), and in the spring the company is rolling out 12 more teams — as well as a Stanley Cup celebration pack, complete with a miniature Stanley Cup. The coolest part, though, is the rink. This was launched in September, too, and it allows kids (and adults) to play their own games of mini hockey using Playmobil’s figures and action stands that make it easier for the toys to move around the rink and shoot the puck. 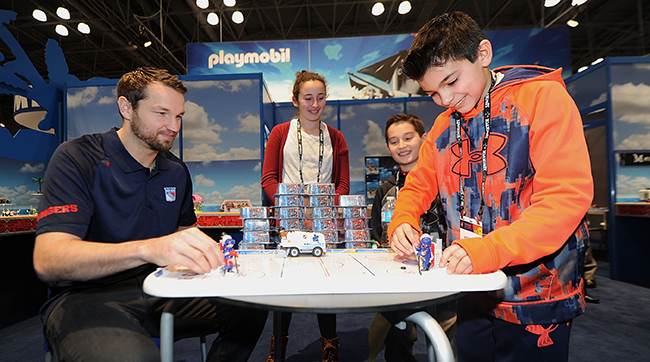 We caught up with Nash at the Playmobil booth to talk toys, hockey, and Stanley Cup superstitions. What toys did you play with as a kid? I played with a lot of He-Man toys, Ninja Turtles, GI Joes. We used to play with almost miniature bubble hockey machines where you control it [in the] back there. And that's why it was so cool when I saw this one, it was... You're on the ice instead of standing behind it, and that was the coolest thing. When you get one of these sets, how are you playing with it? Are you playing as yourself? I have a bubble hockey [machine] and there's only so far you can go. It's up and down, side to side. But when we did the event in September when we launched it with the Original Six teams I was playing against kids and it's crazy because you can control where you want to be, you can make plays. It’s more realistic than your standard bubble hockey. My son's a bit too young to play with this, he's only 16 months, but he plays with the Zamboni, loves the Zamboni. And once I launched the product, the next day I went to the rink and there were like six guys who have older kids asking me for them and I got them and they said their kids just love them. The guys with kids love it, and I think the guys without kids don't even know I probably do it. So it's kind of funny. I've come a long way in my 14-year career. At first it wasn't Playmobil, for sure. But it's been a great partnership with them and the NHL and myself. Now that you're working with Playmobil, are they coming to you and asking, How can we make this better? Not much. I think they have toy professionals for that. I mean, who would've though to put the Stanley Cup and then the two guys who hold the Stanley Cup. That's genius. When I was a kid, seeing a toy Stanley Cup was the coolest thing because you never saw that anywhere. I agree, yeah. So true. You wouldn't find that anywhere... They haven't been to me too much on the procedure of expanding it. But I think the biggest thing is that they're bringing out 12 new teams. They launched the Original Six in September, and now they've got the 12 new teams in the spring, which, from my understanding, every city wants to have their team so the kids could play as their hometown favorite. Does the don't-touch-the-Stanley-Cup superstition NHL players have apply to this, too? Are you not touching the toy Stanley Cup? It does. It applies to this. I've never touched it, to this day. Even as a kid, you always just know that rule. And if you're ever lucky enough to see it you just don't touch it. That's the hockey player rule. ​If a kid gets this toy and says, “Man, I love hockey,” what do they do from there to actually start playing hockey? I think the fun part is this can kind of get them into the game, as we're trying to grow the game of hockey around the world, obviously. I think this gives them the imagination of what they can do on the ice if they practice hard. I think it just makes it more realistic instead of the bubble hockey where you can only go up and down. With this, you can kind of have an imagination to it and figure out the game that way. So if a kid who wanted to play hockey for real, how can they get started? I think you always start at a hockey school, a hockey camp. They have tons of them, I know, around New York. And I know back home in Canada where I'm from it seems like there's a rink on every corner that always has kids playing hockey. And I think the biggest thing they got to do is go to their local rink, go public skating, figure out how they feel on the ice with skates on. It's the only major sport that uses a different form of transportation, it's kind of interesting. Every other sport you're running on your feet with running shoes like we're all used to. This is the only sport where you're using a different form of transportation. So I would say go public skating, go get comfortable on the ice, and then take it from there.